Today, 844 million people still lack a basic drinking water service, and 159 million are still dependent on surface water for their everyday needs. These untested and untreated natural reservoirs continue to propagate diseases and decimate natural ecosystems. In ancient times, water pollution was often due to a lack of education about sanitation and a general lack of resources. Today, we know more about the causes of water pollution, but we continue to introduce massive amounts of man-made contaminants into our natural environment. The most common sources of modern water pollution are sewage, industrial agriculture, industrial manufacturing, and mining. Before the nature of waterborne diseases was widely understood, sewage was often disposed of in or near water sources that were also used for bathing and drinking. Although education about water pollution is much more widespread today, less developed countries and communities still lack access to clean water and sanitation equipment. In these communities, there is little choice but to accept the inherent risks of using contaminated water as a condition of survival. Industrial agriculture is the primary method of food production in the United States. It is also the dominant source of two prolific pollutants: fertilizer and insecticide. The massive amounts of fertilizers used in industrial farming enter our natural water reservoirs as runoff. These nutrient-rich contaminants increase the amount of phosphorus and nitrates in groundwater and surface water. This imbalance causes rapid algal blooms, which monopolize dissolved oxygen and suffocate the aquatic plants and animal species that are present through a process known as eutrophication. Along with disrupting the natural environment and reducing food resources, algal blooms can also cause illness and irritation to humans who come in contact with them. The chemical insecticides and fungicides that are used to preserve crops are also transferred via rainwater into our natural environment. Along with being poisonous to insects, these chemicals have been shown to harm humans, animals, and crops and remain present in living systems long after the time of exposure. Although deadly insecticides such as DDT were banned in the U.S. in the late 1970s, alternatives such as organophosphates continue to cause serious environmental problems today. 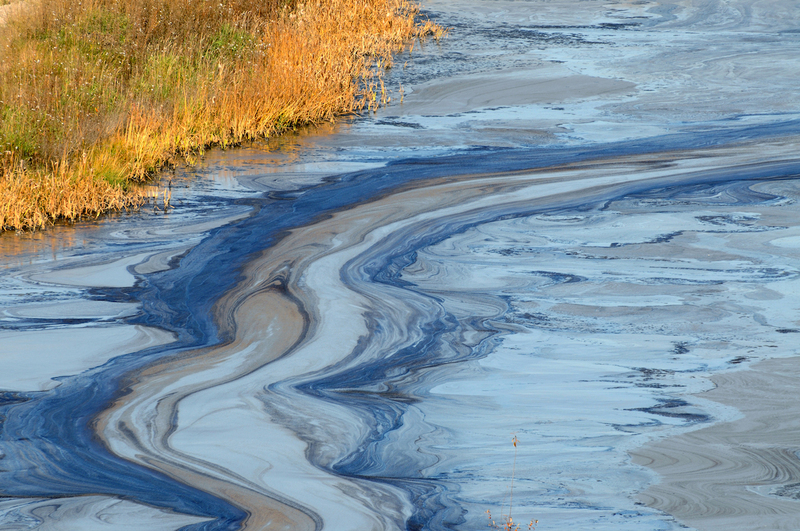 Textile, paper, and pulp factories are some of the largest sources of water pollution. The modern manufacturing process requires massive amounts of water to refine, combine, and cleanse raw materials and transform them into consumer products. This process produces wastewater filled with harmful chemicals such as chlorine, dyes, and detergents. In the U.S. and other developed nations, manufacturing companies are required to treat wastewater in accordance with national standards before it can be released back into natural reservoirs. In other parts of the world, however, industrial wastewater processing is less closely monitored and regulated. When chemicals from the manufacturing process are released into the surrounding environment, they poison local animals and plants. Mining is one of the most lucrative industries in the world and also one of the most significant sources of pollution. Mining and smelting operations produce contaminants such as lead, zinc, copper, mercury, cadmium, and nickel. These naturally occurring heavy metals are transferred via runoff into surrounding streams, rivers, and oceans. In elevated quantities, they are extremely toxic to biological life—including humans, plants, and animals. Because the modern world is rife with man-made pollutants, water quality monitoring technology has become increasingly vital to our well-being—and that of our ecosystem. In the past, environmental researchers lacked the tools necessary to track natural water pollutants on a large scale. In order to measure changes to groundwater and surface water, they would collect water samples from various locations and transport them back to a laboratory for testing with benchtop meters. In addition to being time-consuming, this process also introduced more room for error, as samples could be mislabeled, lost, or altered in transit. The introduction of portable meters revolutionized this process by enabling researchers to take water quality readings on location. Although samples could still be collected for further study, researchers could calibrate their tester and collect, store, and timestamp data from the field. Bluetooth testers are the next logical step in this technological evolution. Unlike portable meters, Bluetooth testers have built-in electrodes, which means less to transport and care for in the field. Because they’re operated via a smartphone app, they also empower users to browse and share data in real time via the cloud, expediting the data collection and analysis process. The introduction of Bluetooth to water quality instruments also changes what’s possible from a data-tracking standpoint. For instance, using your smartphone’s GPS system, Bluetooth testers are able to geostamp readings (in addition to timestamping) to ensure more consistency between tests and provide more insight into testing conditions. Bluetooth testers also have applications beyond the research sector. Because they can be operated via a familiar smartphone interface, they’re exceptionally intuitive to use. By guiding users through the calibration and testing process, Bluetooth apps eliminate the need for prior knowledge of or experience with water testing equipment. This essentially opens the door for users of all experience levels to use Bluetooth testers to measure water pollution in their homes and when traveling abroad. To learn more about our Bluetooth testers and become a Jenco distributor, follow the link below.